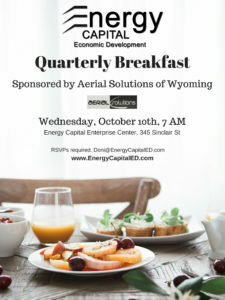 Business leaders are invited to Energy Capital Economic Development’s Quarterly Breakfast on Wednesday, Oct. 10. The breakfast is sponsored by Aerial Solutions of Wyoming and begins at 7 a.m. at the Energy Capital Enterprise Center, 345 Sinclair St. The event is free. Chris Leatherman, FAA certified drone operator and chief pilot for Aerial Solutions, will visit with attendees about aerial photography and videography services in Campbell County. Energy Capital Economic Development will give an update on its previous quarter’s activities. RSVPs are required, and space is limited. Please RSVP by Friday, Oct. 5, by emailing doni@EnergyCapitalED.com or calling 307-686-2603.